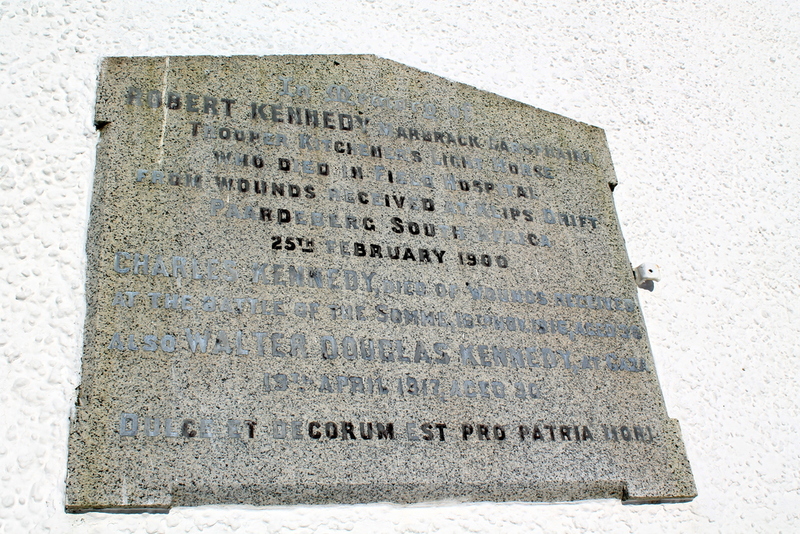 (Plaque on Church wall) In memory of Robert Kennedy, Marbrack Carsphairn Trouper Kitcheners Light Horse who died in field hospital from wounds received at Klips Drift Paardeberg South Africa 25th February 1900. Charles KENNEDY, died of wounds received at the battle of the Somme, 16th Nov. 1916, aged 36. Also Walter DOUGLAS KENNEDY, at Gaza, 19th April 1917 aged 30. Dulce et decorum est, pro patria mori. GC, “Kirkyard gravestone 207,” Carsphairn Archive, accessed April 21, 2019, http://carsphairn.org/CarsphairnArchive/items/show/229.